Sunday 21st April - 9am to 12:30pm. Sunday 28th April - 9am to 12:30pm. Until further notice, the car park next to the lake and golf course is closed. This is because the car park will be used by contractors working on the School grounds for storage of machinery and access will be required whilst work is in progress. Therefore, under no circumstances should members drive up to the car park. Harrow School security have been instructed to report any members who does so and loss of permit may result. This situation is likely to continue until June. Members will still be able to access the lake on foot (with tackle) in the usual way. The ONLY exception to this is for our Disabled members who hold a valid HSAC Disabled badge, who may continue to drive up to the car park to drop off tackle and then park in the Disabled bays at the Sports Centre. Remember to display your blue badge. The Golf Course toilets will also be out of bounds for the same period. However, in the meantime, members will be able to use the toilet facilities in the Sports Centre. A warm welcome to all our new members and thanks to the 51 members who attended the AGM. The minutes are enclosed with this newsletter. An insert for your rule book is also enclosed with this newsletter. Please note the rule changes relating to Fish Care. These new rules have been introduced to safeguard the health of our fish. Please always exercise great care when playing, landing and handling fish so that they are returned to the water with as little stress and damage as possible. Fish must not be placed on the ground and the Fisherman’s Cabin has generously offered unhooking mats to club members for £10. The car park adjacent to the lake and golf course is now closed until further notice due to construction work. This work is likely to continue until June and in the meantime under no circumstances should members drive up to the lake. The only exception to this is for our disabled members who hold a blue badge and the HSAC parking badge, who can continue to drop off tackle at the lake and park in the Disabled bays at the Sports Centre. However, at present there is no car parking at the lake. 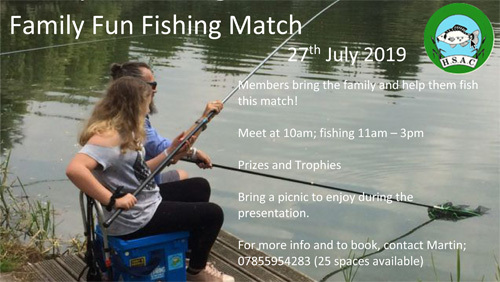 Please support the Family Fun Fishing Match on Saturday 27th July. It is important we try to encourage new members to join the club. So, if you have any family members or close friends who might like to try out our wonderful sport please bring them along. Places must be pre booked by contacting Martin Fowler on 07855954283. Secretary – Dave Bartlett (07721619342), Treasurer – Bryn Bishop, Match Secretary – Bob Gilligan (07930961101), Deputy Match Secretary – Trevor McGahey (07444047925), Water Management Team Leader – Mark Grassi (07739465399), Committee members – Adam Fowler (07967797261) Martin Fowler (07855954283), Danny McGahey (07950909635), John Pope (020 841 60599), Darrell Waldron (07900336536), Ian Wood (07736707384). Web Editor – Sam Brown (c/o Fisherman’s Cabin, 020 8248 8100). Please read the fixture list on the back of this newsletter and note the days that the lake is closed. As always please be vigilant for signs of poaching or anyone acting suspiciously around the lake and report anything suspicious immediately using the emergency contact numbers in your rule book and on the noticeboard or contact the committee on the above numbers. Remember, there is NO public access or right of way around the lake and as a club member you are entitled to politely challenge anyone on the lake. Finally, many thanks to all the members who have generously given a donation to the club and to those members who have attended the work parties. Your support is greatly appreciated. Good evening everybody and welcome to the 2019 AGM. There are just a few matters I would like to bring up tonight: Firstly the issue of the disabled parking at the lake. The construction work that is being carried out won’t be completed until sometime in June, but blue badge holders will be able to drive up and drop of their gear as before. They must however return their car back to the car park as there is no vehicles of any description allowed to remain in this area. This is strictly reserved for blue badge holders only and so we ask you to take note of this. I have regularly been asked by members about the fallen tree which still remains in the lake. The last conversation I had with Tom, who is the head Woodman of the school, told me that they are waiting until early summer when the Harrow boys go on their summer break before they can attempt to deal with it. As you may already know we have had a recent restocking at the lake which has consisted of: 200lb of Skimmers, averaging 1.5lb. 200lb of Carp, mainly Mirrors, averaging around 2lb and over 100 small Perch. This continued stocking program has increased the stock levels by over 800lb in the past 2 years. I must just add that the quality of the recent fish stocked were some of the highest quality fish we have been provided in my time in the club. This is all thanks to Dave Bartlett for finding us a new fish supplier. Well done Dave! Whilst on the subject of fish in the lake, unfortunately I have seen quite a few of our Tench and other species for that matter, being caught with damage to their mouth’s. It is a fair assumption that some of this damage will have been caused by bad Angling, too strong a line and Rods far too powerful for this size of fish. With this in mind, the committee have decided that moving forward any rods used at the lake must not exceed 1.75lb test curve and at the same time we remind you that the maximum line allowed is 8lb and maximum hook size must not exceed a size 8. I am only emphasising the point because these fish belong to us all and the welfare and health of them is our collective responsibility. During my patrols as bailiffs at the lake I’m still coming across members both new and old who do not have their club card with them. This puts me in a very awkward and uncomfortable situation as I should be asking these members to pack up and leave the lake. But as you can imagine it would not prove very popular, and believe it or not I do not want to spoil anybody’s day fishing. So can I just remind you that it is a term of our lease with Harrow School that all of our club members are in possession of their club cards whilst on the Harrow school grounds. Please make an extra effort to ensure you have your club card with you at all times, and make a sometimes grumpy Bailiff happy. With that out of the way lets move on to something more positive, I now have the pleasure this evening of welcoming two new members onto the committee namely, Adam Fowler and Ian Wood and I am extremely confident they will prove to be an asset to the club. At the same time may I take this opportunity on behalf of the club to thank Sean Fowler who is stepping down from the committee this evening, for all of his hard work and support over the past few years. We wish Sean well and look forward to seeing him on the lake next season. On the subject of thank you’s it would be remiss of me not to mention the following people. Firstly my sincere thanks must go to Sam Brown. Sam is always working extremely hard in the background for the benefit of you all and most of his work goes unnoticed. Sam truly supports the committee In the well running of this fishing club. So Sam thank you very much. It naturally goes without saying that Dave Bartlett truly is the backbone of this fishing club and again most of his hard work takes place behind the scenes. This ranging from membership renewals, liaising with the various authorities we are affiliated too and basically the general running of this club. Without Dave we would have no club so again please join me in a big thank you to Dave. Also a big thank you must go to Bob Gilligan our match organiser, for giving up his Sundays to run our club competitions come rain or shine. Without Bob we would not be able to have the number of matches we do and we must help and support him whenever possible. So again on behalf of everyone who fishes the matches, thank you! And finally, I must as always thank the Fisherman’s cabin for the help and they provide to our club and its members each and every year, so let’s continue to support them. Tight lines and thanks for coming. Our 2018/19 AGM & Presentation evening will be held on Thursday 28th March 2019 at the Post Office Club, 136 Greenford Road, Sudbury Hill, Harrow HA1 3QL (situated behind the Rising Sun pub). AGM will start at 8pm. This is a return to our previous AGM venue following feedback from members about last year’s venue (Harrow Cricket club). We hope this change will meet with members’ approval and lead to a bigger attendance. As usual sandwiches and snacks will be laid on and there is plenty of car parking available at the club. Motions or proposals to be included on the AGM agenda and applications for committee membership must be submitted to the Secretary before 7th March. After this date you will be able to view the proposals and motions on the club website and notice boards. This year you will again be able to renew your membership at the AGM. Committee members will be at the club from 7pm to accept your membership renewals before the AGM starts at 8pm. There is therefore really no excuse for late renewals. Please bring your membership renewal form as this will speed things up. Please also bring a passport photo, SAE and full (preferably exact) payment. Unfortunately, we cannot accept card payments. If you wish to pay by bank transfer, please see your renewal form for further details. You will not receive your new permit at the AGM. Permits for next season will be sent out in April. Renewals for next season’s membership must be received before 31st March and new members will be considered for membership after this date. This year we have again frozen membership subscriptions. The work party levy remains at £20, but this close season senior members now only need to complete one work party to receive the refund. Our current treasurer, Emily Benford, is standing down at the AGM. We are very grateful to Emily for her hard work in keeping the club’s finances in good order. For the club to continue to be run efficiently we must fill this position. We therefore encourage anyone who feels they can carry out this important role to let the secretary know and further details will be provided. We are also looking for new committee members, so if you are interested and would like to know what the role entails please let us know. Work parties will be held at Harrow on the following dates: Sundays 7th, 14th, 21st and (if required) 28th April. Times are 9am to 12.30pm. There is a lot of work to do to maintain the lake as an attractive and enjoyable place to fish, so please try to attend a work party and don’t forget senior members can receive a refund on their subscription. Members attending the work parties will also be invited to join the water management team so that we can build up a pool of members who are willing to assist with lake maintenance during the season. Before the start of next season, we will be stocking 200lb of carp (averaging 2lb), 200lb of bream (averaging 1lb) and some perch (8oz-1lb).